Current Noble Park FC players Nic Pereria, Kyle Martin Kevin Kean and Dean Jones. There’s no doubt that Noble Park Football Club has been a staple of the local community for a very long time. 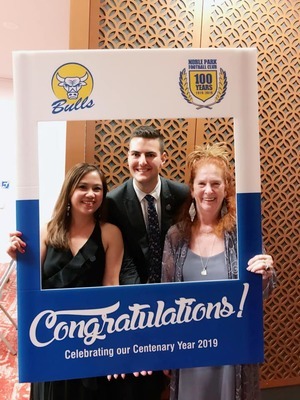 The sheer length of that time may surprise some as last weekend the Bulls celebrated their 100th anniversary with a special evening for all involved. With ex-players, current players, supporters of all ages and local community members enjoying the night, it was an opportunity for people to come together and catch-up. Noble Park president Grant Connolly spoke about the night and the how great it was for people of different eras to come together. “The night was spectacular, with over 400 people there,” Connolly said. “We had a few interviews with ex-players scattered from guys from the 50s, 60s, 80s and guys from the more recent 10 or 15 years. Former players sharing their experiences with current players was another moment to savour and really brought home what it’s all about to be a part of a football club and the Noble Park Football Club certainly has a proud history. 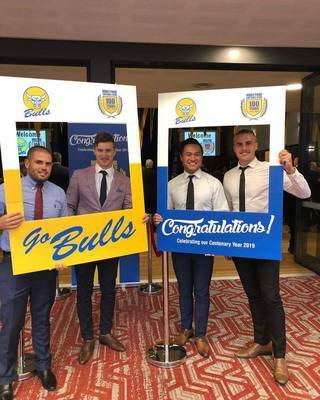 “We were super keen to have the present-day players there to understand and see the history unfold in front of them on the night,” Connolly said. “To see the older guys get up and talk about what they went through and their experiences with the club, it really hit home to them that the club has been around for 100 years. “You turn up one year and you don’t really think about the last 99 years, but it’s real and it’s there and it was absolutely there on the night. Just like anywhere in the world, Noble Park has changed enormously over the past 100 years and Connolly is proud of the way the club has evolved over that time and especially in more recent years. “Just the people that are involved with the club now, compared to even 15-20 years ago – it’s a very multi-cultural area with a real cross-section in backgrounds,” he said. Noble Park kicks off its 100th season at home against Doncaster on Saturday in what promises to be another great day for the club.